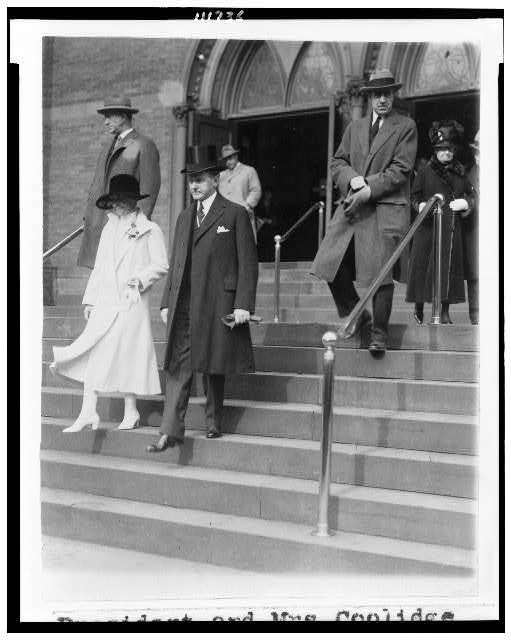 President and Mrs. Coolidge leaving First Congregational Church on a Sunday morning after services during their time in the White House (Courtesy of the Library of Congress and the U.S. Secret Service Archive). If one crosses New England’s valleys and hills one will inevitably encounter ubiquitous clapboard Congregational meetinghouses. These places of worship crown the town greens of villages throughout the region. Their faith, the faith of the Puritan pilgrims, is a foundational element of the American ethos. Theirs is the faith of the first Thanksgiving, of Jonathan Edwards’ “Sinners in the Hands of an Angry God,” of the Salem witch trials, and of the heart and soul of the First Amendment: the freedom of religion (though most of the early Puritans came to the shores of British North America seeking religious freedom for themselves, not for others). Puritan Congregationalism has shaped the contours of American civic and religious life for hundreds of years. This simple, unpretentious Yankee faith marked President Coolidge throughout his life. During their years in the White House he and Mrs. Coolidge were regular parishioners at the First Congregational Church in Washington, D.C., a storied house of worship with a long tradition of commitment to the social gospel principles that have marked post-colonial Congregationalism. First Church helped found Howard University in 1867, and was one of the few racially integrated D.C. parishes of the era. This spirit of social conscience was nurtured under the leadership of the Rev. Dr. Jason Noble Pierce, pastor of First Church during the Coolidge’s Washington years. Pierce served at First Church from 1920 to 1930, and, like President Coolidge, was an alumnus of Amherst College (Class of 1902). He served congregations in Massachusetts before being called to First Church in September 1920. 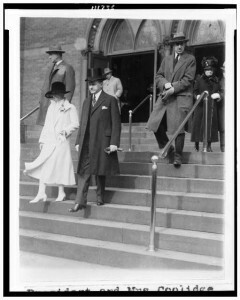 The Coolidges began worshiping at First Church from the time they arrived in D.C. as vice president and Second Lady of the United States in 1921. According to the First Congregational Church’s official history, the Coolidges were regular churchgoers, and were often joined by their sons Calvin, Jr., and John whenever they too were in Washington. President and Mrs. Coolidge largely reflected that modest mode of religious expression exemplified by the Plymouth Notch of the president’s youth. In his Autobiography President Coolidge notes that one of the first things he did as president, in the hours after being notified of Warren Harding’s untimely death, was send a telegram to Dr. Pierce requesting a meeting with the cleric upon his arrival in Washington. President Coolidge never divulged what counsel Dr. Pierce provided him at that time, but one can surmise that Coolidge likely called upon his pastor to seek the blessing of Almighty God for the facing of the hour, as he took up the heavy mantle of the presidential office. Dr. Pierce understood President Coolidge’s humility, and welcomed him into his flock in the most unostentatious way possible. This reflects well upon the overarching spirit of Calvin Coolidge’s religious faith: humble, quiet, never boastful, but very deeply felt. Coolidge valued his faith and the traditions from which it sprang, and he never ceased to extol the virtues of religious belief and practice among the American people during his time in the White House. His dedication to our civic religion continues to be admired by many to this day. Autobiography of Calvin Coolidge, p. 19-20. Autobiography of Calvin Coolidge, p. 178. Autobiography of Calvin Coolidge, p. 180. “Coolidge Becomes Member of Church: Formally Elected by First Congregational in Washington—Joining Dates from Aug. 5,” New York Times, October 19, 1923. “Church Council Honors Coolidge: Congregationalists Make Him Honorary Moderator—Favor Union with Presbyterians,” New York Times, October 18, 1923.